Officials at Inter Milan have denied an allegation that manager Jose Mourinho hit a fan in the face after Wednesday's Champions League match in Manchester. A fan has said Mr Mourinho punched him as the Portuguese manager left Old Trafford stadium following Inter's 2-0 defeat by Manchester United. In a statement the Italian club rejected the claim, saying it had been a "very calm post-game experience". Police said a complaint had been made and CCTV footage was being looked at. The Inter Milan statement read: "At the end of the game, the Portuguese tactician gave interviews to the European media, signed autographs, watched the penalties of the Roma v Arsenal game before saluting (Sir Alex) Ferguson in his office. "After giving the last interview to Inter Channel, he entered the team bus that was parked outside the dressing rooms and hence it was a very calm post-game experience." 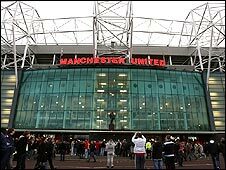 A Greater Manchester Police spokesman said: "Just before midnight on Wednesday 11 March 2009, a man reported he'd been punched in the face outside Old Trafford. "Police are investigating this common assault allegation. Inquiries are ongoing." 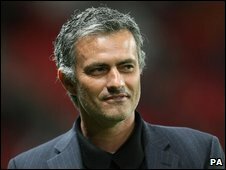 A spokesman for Manchester United confirmed they were aware of the allegation but made no further comment. The supporter is alleged to have chanted to Mr Mourinho: "You're going home, you're going home." The Inter manager had seen his team crash out of the Champions League competition as a result of the 2-0 defeat. The supporter later went into Stretford police station, close to Old Trafford, to allege he had been attacked. The fan, who is not from the Greater Manchester area, did not report any injuries to police and did not need treatment.